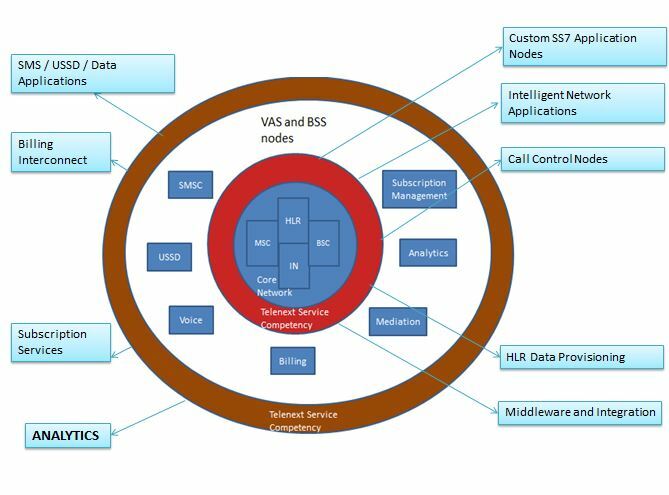 Telenext Systems Service Offering centers around the core network components and the adjoining BSS / Value Added Services domain. work on this plane. Custom built applications to satisfy a particular business case can be built on the current Telenext platform and telecom experience to provide a robust and capable application. Applications like IVR Portals, SMS Delivery, Subscription Management, USSD Client and CMS, MMS Clients can be built around this layer. Telenext is also working on next generation Analytics for the telecom operator and Vendors to churn trends and perform KPI mapping. The client needed to differentiate from the basic SMS based subscription services and hence wanted to engage subscribers in USSD based selection of content subscription and reliable periodic delivery of content via SMS as well as WAP. Telenext systems built the complete solution offering with USSD Client, Content Management System, Subscriber as well as Subscription management system and the SMS push capability to survive high transient loads of peak time deliveries. The system not only delivered text content like News, Sports update, Weather but also could deliver rich entertainment content via WAP SI messages. As a planned upgrade features were later added for the on-the-fly subscriber billing and multiple delivery routes with route load sensing. An application primarily targeted towards the B Cities and C towns of India and enabling the power of micro-finance to the masses. USSD was the obvious choice since even the most basic handset supports USSD and there is no requirement for data connectivity. The application provides the user with an On-screen menu through which the user can link their account and authenticate it along with the capability to check balance, last transactions and also initiate basic P2P transfers. Status - Deployed. Live with limited user base. A business requirement around an innovative idea. Prefix a number to the number you are trying to call and you can hear a sponsored message which earns you benefits before the call finally gets connected. The idea is simple but the technology implementation involved designing a comprehensive Intelligent Network based system with Service Control Point and Service Routing Points. The network is configured to trigger the system node via CAMEL which set's up a announcement channel and post the announcements sets up the regular call. Dial into a toll free number and conference with a friend for free. Conferencing is commercially supported by advertisement. The system also has a comprehensive advertisement campaign manager as well as subscriber profiling engine. A new application currently undergoing testing to bring the power of Blackberry like Email push Notification to the masses with basic or feature phones. The service uses a mix of USSD and SMS to enable the push notification.